Every serious person starting their Juice Plus+ business has Fast Track to Sales Coordinator as their #1 Goal, with the 2000+ as their first stepping stone goal. New distributors in their first 180 days (6 months) and their sponsors. Step 1: Complete your Fast Track to VF in your first 30-60 Days. Step 2: Continue that same momentum to build your customer base and team. Step 3: Build the structure needed by helping your team to Fast Track to VF. $600 bonus and conference ticket  paid immediately to the new Sales Coordinator. $600 bonus  paid immediately to the sponsor of the new Sales Coordinator. 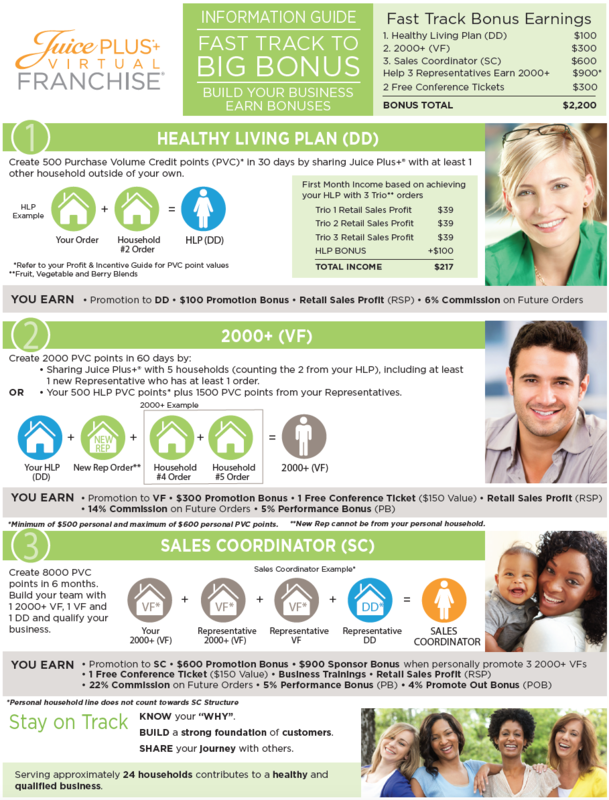 Corporate Business Partner, Tier One status and Sales/leads from juiceplus.com. You must submit a Report of New Promotion form as usual, selecting the Sales Coordinator Fast Track option. Once verified, separate checks will be written and mailed. Login to your Virtual Office under My Team Data/Position Advancement to learn more and track your teams progress! Brand new distributors have 180 Days (6 months) from their application date to fulfill the above requirements. Existing Virtual Franchisees with a 2,000 PVC points credit must complete 6,000 NEW Promo PVC points with above requirements between Conferences: October 1 and March 31 or April 1 and September 30.